Amid reports that Special Counsel Robert Mueller is expanding his probe into alleged Russian interference in the US elections and possible collusion and obstruction of justice by the Trump White House, Attorney General Jeff Sessions held a press conference Friday to announce a crackdown on leaks of classified and sensitive information. Sessions, who was joined by Director of National Intelligence Dan Coats and Deputy Attorney General Rod Rosenstein, raised the threat of reprisals against reporters who publish leaked information. In recent days, President Trump has publicly disparaged Sessions for failing to aggressively counter the almost daily flow of media reports, coming from intelligence sources or from within the administration itself, exposing details of contacts between Trump aides and Russian officials and other information embarrassing to the White House. One day before the Friday press conference, the Washington Post published transcripts of Trump telephone calls with Mexican President Enrique Pena Nieto and Australian Prime Minister Malcolm Turnbull last January in which Trump tried to bully his foreign counterparts into lining up behind his “America First” immigration and trade policies. Trump’s battle with the press is part of the raging factional warfare within the ruling class and the state centering on differences over imperialist foreign policy. The “liberal” press, spearheaded by the New York Times, the Washington Post and most of the TV news outlets, is aligned with sections of the intelligence establishment opposed to Trump’s efforts to improve relations with Russia and determined to affect an escalation of the confrontational policy initiated by the Obama administration. This is the reactionary basis of the Democratic Party’s opposition to Trump, not the administration’s overall militarism, its attacks on immigrants, social programs and democratic rights, its staff of billionaires, generals and neo-fascists, and its open appeal to the most reactionary social forces. The corporate-controlled media, for its part, has discredited itself with wide swaths of the public by serving as a conduit for government propaganda and lies, the most notorious example being the claims of Iraqi weapons of mass destruction used to justify the 2003 invasion. And the official narrative of Russian meddling in the US election, for which no serious evidence has been provided, has evoked broad public skepticism. 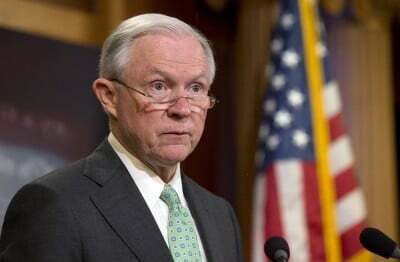 At the press conference, Sessions said that his Justice Department had already tripled the number of active leak investigations over the Obama administration. He boasted that in the first six months following Trump’s inauguration there were nearly as many criminal referrals concerning leaks of classified information as there were in the previous three years combined. The irony of this statement coming from a country that has been caught bugging the offices of the United Nations, NATO and the European Union and tapping the personal telephones of leaders such as German Chancellor Angela Merkel evidently escaped the attorney general and the other officials on the podium. Rosenstein, who took questions from the press, said the new FBI unit would focus on investigating leaks to reporters. He said he would meet with media representatives to discuss the leak crackdown next week, but evaded a reply when asked if prosecutors would rule out bringing criminal charges against reporters for doing their jobs. The announcement of a crackdown on leakers and the media followed reports on Thursday that Special Counsel Mueller was using a grand jury in Washington DC to conduct his investigation as well as a previously reported grand jury in Alexandria, Virginia. The Washington panel has reportedly issued subpoenas for documents concerning the June 2016 meeting between Donald Trump, Jr., Trump aide and son-in-law Jared Kushner, his then-campaign director Paul Manafort and a Russian lawyer with Kremlin connections as well as other Russian officials. Recent reports based on leaked information say that Trump personally dictated a misleading statement initially released by his son concerning the meeting. Mueller’s use of a Washington DC grand jury indicates that his probe is encompassing the White House itself, possibly including the president, and that it will continue indefinitely. In addition, bipartisan measures have been introduced in both the House of Representatives and the Senate designed to block Trump from firing Mueller. Under these conditions, Trump has over the past two weeks sought to base his administration even more directly on the military and the police while directly appealing to far-right social elements through anti-immigrant and anti-minority racism, law-and-order demagogy and anti-gay prejudice. (See: “Trump makes an appeal to the fascistic right”). The Democrats will not oppose this appeal to ultra-right forces. On the contrary, they are seeking bipartisan talks with the Republicans on ways to shore up the insurance markets at the expense of health care for workers, cut taxes for corporations and the wealthy, and provide more profit windfalls for business under cover of an infrastructure program. In attacking press freedom, moreover, Trump is building on the foundation laid by Obama. During his tenure, Obama prosecuted twice as many journalists and whistleblowers under the Espionage Act as all previous administrations combined. The Obama administration’s attack on the press included the jailing of Chelsea Manning for revealing US crimes and intrigues in Iraq, Afghanistan and around the world, the imprisonment of ex-CIA agent John Kiriakou for exposing CIA torture of detainees in a television interview, and the secret seizure of the phone records of Associated Press reporters.